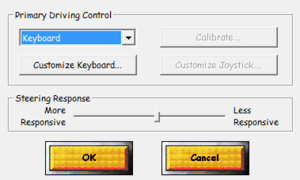 Palette issues with software rendering under Windows Vista and higher can be corrected using compatibility settings. Extensive electronic manual containing detailed information on every aspect of the game. Hardware-accelerated rendering has lower texture quality than software rendering. Truck O Rama MTM-1 Archive for additional tracks and trucks, along with instructions on how to install them. 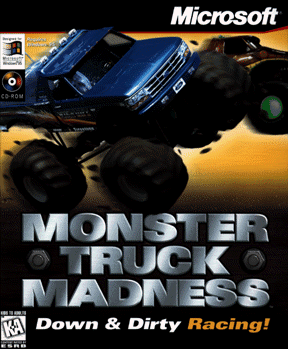 One of the possible installation options, Complete, installs all game files to your hard drive (200 MB) for playing without the disc. Has the side benefit of making the game portable. A limited selection of low-quality songs will be used if the game CD (or any CD-Audio CD) isn't in the primary CD-ROM drive. From the menu bar at the top of the screen, select "Options". From the drop-down menu which appears, select "Game". Uncheck "View Clip Scenes" if you also want to skip videos shown between races. 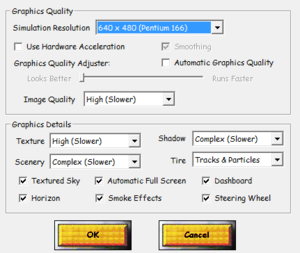 Can be added using your GPU's control panel when using hardware rendering. Can be enabled by replacing "antialiasFlag=0" with "antialiasFlag=1" in MONSTER.INI. MSN Gaming Zone is no longer available. 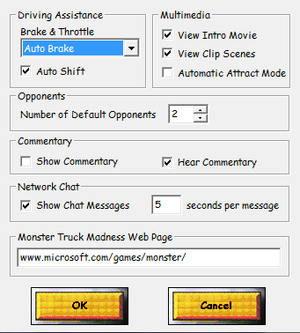 Right-click MONSTER.EXE and select "Properties". Check checkbox for "Run this program in compatibility mode for:", and from the dropdown box which becomes enabled, select "Windows 95". Check the checkboxes for "Run in 256 colors", "Run in 640x480 screen resolution", and "Run this program in administration mode". Run the game as normal, selecting "yes" for the UAC prompts which appear. Windows Vista and later need an update to open legacy Help files. Install the Windows Help program. CD music requires the disc in the first drive (CD-ROM 0). 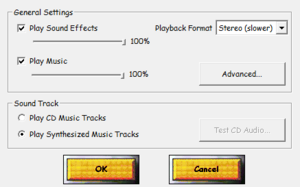 Some virtual drive software might not support CD music. Check that the drive is set to CD-ROM 0. MSN Gaming Zone Shut down June 16, 2006.